Hayes addresses hundreds of delegates at the MLK Civil and Human Rights Conference in Atlanta. At its annual event commemorating Martin Luther King Jr.'s birth, labor and civil rights activism, Atlanta-based Delta Flight Attendant Spencer Hayes brought the crowd to its feet as he passionately spoke about the Delta Flight Attendants' historic movement to attain collective bargaining rights at Delta Air Lines. "This is truly a historic moment in the history of Flight Attendants at Delta Air Lines," said Hayes. "Just two days ago, we filed more than 12,000 signed authorization cards with the NMB. That's more than enough to have a union election at the world's most profitable airline." Over 500 AFL-CIO delegates in attendance who traveled to Atlanta, the birthplace of the IAM, to honor Dr. King's tireless civil rights advocacy cheered as they saw Martin Luther King Jr.'s spirit alive in the Delta Flight Attendant's movement for a voice. "The difference between being union and non-union is more than just pay and benefits, it's about having a voice and having the right to use it," continued Hayes. "We have those rights as American citizens, but for some strange reason we lose them the minute we walk through the door at work." Hayes' speech brought to life the famous quote by Dr. King: "Our lives begin to end the day we become silent about things that matter." 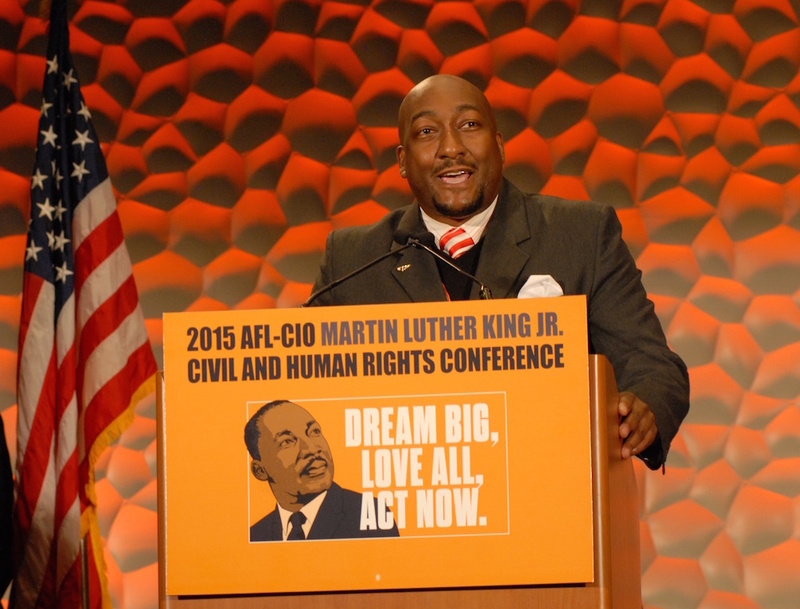 For more information about the 2015 Martin Luther King Jr. Civil and Human Rights Conference click here. AFL-CIO, Atlanta, Delta, flight attendants, IAM, Martin Luther King Jr.